Ten years after the first edition of Rick Warren’s The Purpose Driven Life was released, Zondervan has now released a new 2012 “Expanded Edition” of the New York Times best seller geared for a “new generation.” As the cover of the new edition reads, over 32 million copies of The Purpose Driven Life have been sold. This special Lighthouse Trails report will examine how the new edition has retained Rick Warren’s unbiblical position. The following year, Lighthouse Trails editors heard about a book that was suggesting The Purpose Driven movement had leanings toward the New Age. LT editors purchased a copy of the book, which had been written by Warren B. Smith. The book, titled Deceived on Purpose: the New Age implications of the Purpose Driven movement, was the first book on the market that challenged Rick Warren and the Purpose Driven movement. Since then, Warren Smith has written a follow-up book titled A “Wonderful” Deception, Ray Yungen has added an entire chapter on Rick Warren in a 2nd edition of A Time of Departing (showing Rick Warren’s propensities toward and promotion of contemplative spirituality), and Lighthouse Trails author Roger Oakland included Rick Warren in his expose book on the emerging church, Faith Undone. Needless to say, Lighthouse Trails was very interested to know if Rick Warren has corrected the things that Warren Smith, Ray Yungen, and Roger Oakland challenged him on (from a biblical point of view) in their books. This report will examine these very things. 1. In Deceived on Purpose, Warren Smith contended that Rick Warren’s use of Eugene Peterson’s The Message compromised his book significantly. Since the release of The Purpose Driven Life in 2002, there has been ample documentation proving that The Message paraphrase is not trustworthy, and in fact, is quite misleading. But did this cause Rick Warren to reconsider? No, the new expanded Purpose Driven Life still contains quotes from Eugene Peterson’s The Message (Day 2, Day 8, Day 32). 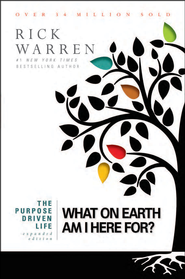 Even though Peterson’s “As above, so below” revision was brought to Rick Warren’s attention by at least one person who sent him a copy of Deceived on Purpose, that didn’t stop Rick Warren from including The Message in his new 2012 edition of The Purpose Driven Life. Once again, Rick Warren dismisses legitimate concerns and includes the Bernie Siegel reference in the new 2012 expanded edition of The Purpose Driven Life. What does Rick Warren do with this misuse of Scripture? You will find the very same misuse in the new 2012 edition of PDL. 4. In the 2002 edition of PDL, Rick Warren distorts the words of Jesus regarding His second coming. In the 2012 expanded edition of PDL, Rick Warren says the exact same thing again. In the 2012 expanded edition of PDL, Rick Warren repeats: “It helps to know that Satan is entirely predictable,” once again underestimating the wiles of the devil and ignoring the many Scriptures that warn us about spiritual deception. 6. In the 2002 edition of The Purpose Driven Life, Rick Warren quotes occultist and New Ager Aldous Huxley (is it any wonder that former New Age follower Warren Smith wrote two books on the Purpose Driven movement!). After incorrectly diagnosing the Apostle Paul as suffering from “doubt” and “depression” rather than persecution, Rick Warren emphasized the importance of “shared experiences” by quoting Huxley. . .
2. In the 2002 edition of PDL, Warren advises readers to use visual reminders throughout the day and gives an example of others who practice breath prayers—Benedictine monks, known for their contemplative spirituality and interspirituality. In the 2012 expanded edition of PDL, Rick Warren again tells readers to consider the example that the contemplative Benedictine monks have set before us. In the 2012 expanded edition of The Purpose Driven Life, Rick Warren repeats this second instruction on using breath prayers. 1. In Faith Undone, Roger Oakland shows Rick Warren’s distortion of biblical prophecy and the return of Jesus Christ in the 2002 edition of The Purpose Driven Life. As this report stated earlier, the new edition of The Purpose Driven Life also takes Jesus’ words out of context regarding Bible prophecy and His return. 2. In the 2002 edition of PDL, Rick Warren takes Christ’s words out of context when he tells readers that those who think about Bible prophecy (i.e., the Lord’s return) are “not fit for the kingdom of God.” Roger Oakland shows how he did this distortion in Faith Undone. In the 2012 edition of PDL, Warrenagain tells readers that they are “not fit for the kingdom of God” if they think about Bible prophecy too much. CONCLUSION: So What IS Different About the new 2012 edition? In a Zondervan promotional video, Rick Warren says that he has learned a lot of things in the past decade about hindrances that keep people from finding their true purpose, and he has put this information in two new chapters: “The Envy Trap” and “the People Pleaser Trap.” He has also added links to both video and audio teachings by himself. While Lighthouse Trails editors have strong concerns about what these teachings will introduce to readers (such as the audio for Day 11, where Rick and Kay Warren talk about how to “connect” with God through “the stillness,” via monks, monasteries, and Henri Nouwen), this report is not on what Rick Warren has added to PDL but rather what he has not removed. Thus, the following can be stated with certainty: the new edition of The Purpose Driven Life is as problematic as the first edition was and could potentially lead a whole “new generation” astray. One only needs to look at the declining condition of America over the past 10 years to see that The Purpose Driven Life (where 60 million people have read it, Warren said recently on a Fox News interview ) has not helped the country or the church get on track. On the Zondervan website, it states: “The Purpose Driven Life is far more than just a book; it is a guide to a spiritual journey that has transformed millions of lives. Once you take this journey, you’ll never be the same again” (emphasis added). As Lighthouse Trails has stated for over 10 years, the Purpose Driven “spiritual journey” is one that should be avoided. Hopefully, this report has shown some of the reasons. While this Special Report does not address issues such as Rick Warren’s P.E.A.C.E. Plan and the Daniel Plan, please refer to the “Related Articles” section below for further documentation on the Purpose Driven movement. NOTE: Books by Ray Yungen, Roger Oakland, and Warren B. Smith are available through the Lighthouse Trails store or most other online bookstores. If you have not read all three of these books – A Time of Departing, Faith Undone, and A “Wonderful” Deception (which summarizes Deceived on Purpose in chapter 1), we highly recommend you do. If you cannot afford the books, please write to us at P.O. Box 908, Eureka, MT 59917, and we will send you a free copy of one of them. Or you can visit our research site where we have extensive free information and many excerpts from these books. Also we have a list of free chapter excerpts that you can access. Saddleback’s Response to Criticism Over Daniel Plan – An Unscriptural Paradox!